By encouraging improved processes and partnerships between local governments, private developers, and other key bodies, WASH Coordination helps create more structured and stable water service delivery in Malawi. Collaborating with government and development partners for more sustainable, effective delivery of water and sanitation services. The majority of Malawi’s 17 million people live in rural communities, where ongoing access to quality water and sanitation services remain a challenge. Over 1,5 million members of the population lack access to safe drinking water; a further 10 million cannot access adequate sanitation services, contributing to ill health and difficult living conditions. WASH Coordination improves access to water and sanitation services. The initiative strengthens processes and partnerships between local governments, private developers, and other key bodies in the sector. To date, the venture has created better access to water and sanitation services for over 16.5 million people. Improving WASH Coordination requires an understanding of the systemic and multi-tiered nature of water and sanitation service delivery (known collectively as WASH services) in Malawi. There are dozens of organizations and hundreds of key individuals contributing to WASH service delivery. Many work in isolation of each other. Under WASH Coordination, EWB members looked at the entire system to identify accumulating challenges and the different organizations and people involved at various levels. Then, we analyzed the opportunities to connect the pieces and create improvements. Better collection and cataloguing of water usage data. Determining the roles and responsibilities of government and developmental partners, and a singular approach to ensure every activity works towards a unified goal. Facilitating discussion between government and private stakeholders to create better linkages. Improving operating frameworks based on insight from service data. Influencing policy decisions and stakeholder strategies through increased understanding of service delivery and the roles of each party. With a more comprehensive overview of the systems at play in Malawi’s WASH sector, the WASH Coordination team was able to develop a framework for more synchronized national operations. This framework eventually contributed to the creation of the Sector-Wide Approach (SWAp) governance model: a support resource to ensure the multiple organizations working in the WASH sector operate within a consistent strategy. The Sector-Wide Approach (SWAp) governance model. A Sector Working Group bringing together a broad group of government representatives from relevant ministries – including Health and Education—and funding development partners who meet quarterly to discuss sector issues. Institutional Development and Capacity Building. A Development Partners Group for discussions between development partners working in the sector. This group reports to the Sector Working Group on financing and strategic interests. The Secretariat for SWAp, responsible for day-to-day coordination of all SWAp activities. The Secretariat role is played by the Planning Department of the Ministry responsible for Water. Stronger connections for a more sustainable service pipeline. WASH Coordination and the SWAp involve a series of processes to enhance government-led coordination of projects, and routine water and sanitation activities. With these practices in place, the Malawian government is better equipped to provide sustainable success in delivering water, sanitation and hygiene services to rural communities. 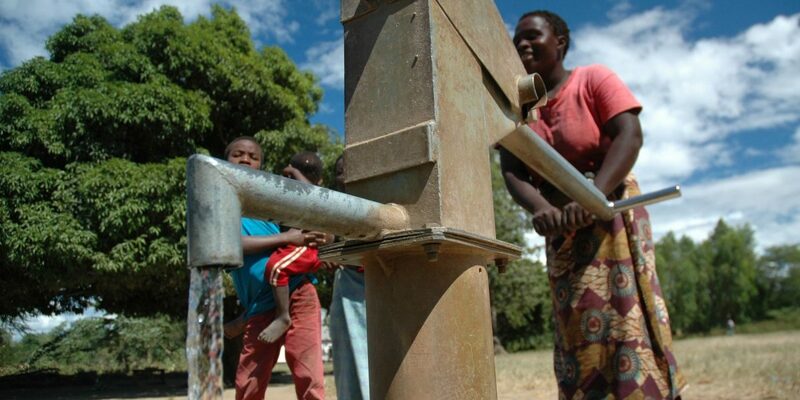 Providing temporary, neutral facilitation and technical capacity between WASH partners. Impartial EWB members supported government and donors to develop practices for more integrative sector coordination. The approach involved consolidating a singular approach to WASH service delivery, rather than multiple district-specific or parallel initiatives. Assisting the Malawian government to implement new processes for better sector-wide coordination. EWB members supported the establishment of whole-sector budgeting frameworks to analyze under- and over-financed areas, and distribute resources more evenly. Supporting government and development partners to better use existing coordination tools. In addition to developing and implementing new frameworks, there was opportunity to more effectively use existing assets. For example, ensuring government investment plans are available to – and adhered by – development partners investing in Malawi. With stronger links between public services and private sector—in addition to a clear, singular approach to nation-wide delivery—the Malawian government is better placed to connect rural communities with ongoing water and sanitation services. Key outcomes from WASH Coordination. Catalyzing more sustainable governance and service delivery. In collaboration with government and development partners, we launched the 18-month ‘Coordinating for Development’ project. The project provides concentrated support to help participating organizations realize the SWAp governance model. The SWAp governance model was chosen by the Government of Malawi to ensure consistent adoption of the strategy required in providing structured, stable WASH services. Engaging key stakeholders at the Water Joint Sector Review. At the 2015 event, EWB members were consulted to present on the WASH Coordination initiative, detailing the purposes of the approach as a framework for improved service coordination, and an analysis of the current standing of the sector. The meeting concluded with the setting of strategic goals. We are currently in the process of working towards these goals, to build a stronger and more synergistic sector. Partnering with global organizations for ongoing support.